The lowest part of the Little River flows into a northern arm of Lake Talquin. The river looks narrow when seen from highway bridges, but is more like the Aucilla or the Upper Chipola River. (Little River, Joe Budd WMA) The Little River has a mixture of high banks and swamp along it's shores. There is always some animal life to observe. The river is influenced by the lake, so when other rivers are low the Little River still has water in most cases. 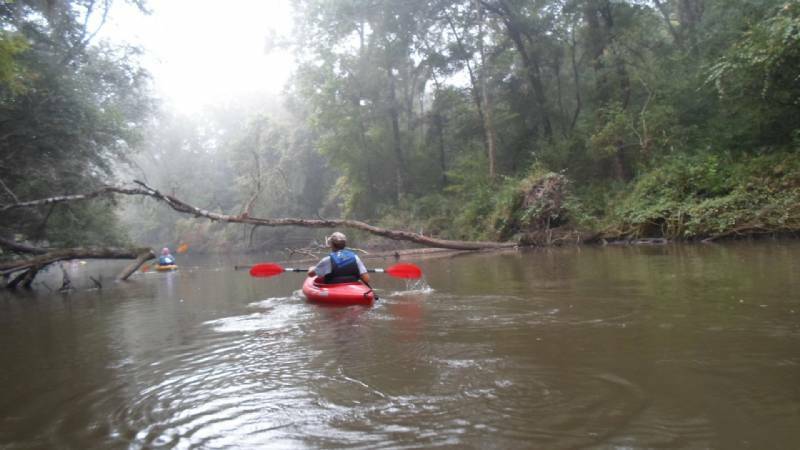 (Little River) This is a 4.1 mile paddle down to the lake and the same distance back. There are 30 foot high bluffs and swamp along the river. Depending on the time of year and how quiet you there are lots on animals and birds. (Little River Road boat ramp) This is a 4.1 mile paddle down to the lake and the same distance back. There are 30 foot high bluffs and swamp along the river. Depending on the time of year and how quiet you there are lots on animals and birds. (Little River Rd boat ramp) The Little River is a dark water stream with swamps and high bluffs. It is in the Joe Budd Wildlife Management area. (SR 268 and Little River Rd.) An 8.2 mile trip from the put in near SR 268 to Lake Talquin and back. It was a clear morning and not too warm. The boat ramp is a little more eroded on the left side, but this makes a good shallow place to load a boat and not scratch it up. Do you want to add a report to Little River, Gadsden County? Location by tom, last updated on 10/19/2014. It has been viewed 2624 times and has 8 posts.